Podium contender Sarah Mitton headlines a quartet of South Shore track and field athletes representing Nova Scotia at this summer's Canada Games. "She's definitely a medal threat, maybe even one of the biggest ones on the female side," said team coach Ueli Albert of the decorated shot putter. The 21-year-old Brooklyn native is a two-time Athletics Nova Scotia junior athlete of the year, a national junior champion, Canadian university medallist and provincial senior womens' indoor record holder. "Anyone who knows me knows I am from Nova Scotia," said the University of Windsor student. "I am very proud to be Nova Scotian and these games are my last opportunity to compete for Team Nova Scotia. How far I've come in the sport has a lot to do with the opportunities and people who helped me get here." At the top of that list is Bluenose Athletics coach Tammy Gaudet, who is part of the Canada Games athletics coaching staff. 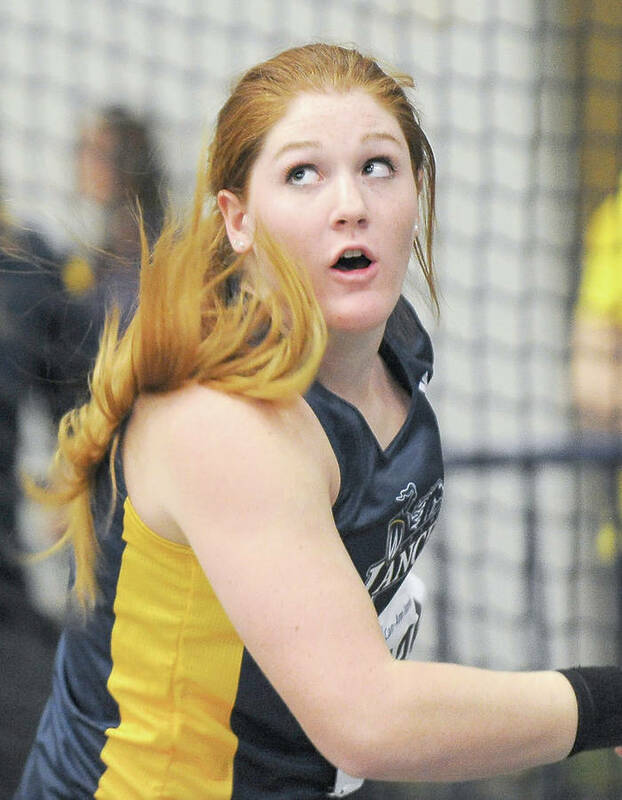 "I had a great coach who did anything she could to help push me to be my best, which usually involved a celebratory ice cream," said Mitton, who is also trying to make her first senior national team and qualify for the world university games this summer. "This season has been truly unbelievable. I have had not only one, but three personal-best results in the outdoor season so far. The first being 15.62 metres and most recent 16.05, and I believe that there is still so much more in the tank." Meanwhile, coach Albert said Lunenburg's Allie Flower is also a dark horse to medal with her Canada Games relay team. "I think we have a top five or even a podium shot there with the 4x4 women if everything goes well." The 20-year-old won four medals at the Atlantic championships with St. FX in 2016-17, which gave her a boost heading into this summer's Canada Games qualifications. "The last round of Canada games I was also eligible but I was too scared to try out," said Flower. "I just didn't have the confidence in myself." However, by this June, she was slicing two seconds off her personal best time at the prestigious Aileen Meagher meet in Halifax. Javelin thrower Josh Bell is a former national youth champion and four-time provincial high school gold medallist who said working with coach Steve Wohlmuth has helped him improve by leaps and bounds. "I expect to wear Nova Scotia across my chest with pride in knowing that our province will be well represented at the games with a talented group of young, respectful, driven athletes who want to do the best they can in the sport they love," said the recent Park View graduate. Finally, hurdler Ben Conrad opened eyes with a blazing time at the Canada Games trials. "He's made a big improvement from last year to this year," said coach Albert. "The final is definitely within reach for him, and if you do that, anything can happen." The Bridgewater resident is a three-time All-Academic Great Northwest Athletic Conference team member with Simon Fraser University. "Being a member of the Canada Games team is an opportunity to represent Nova Scotia at the national level and show how strong the province has become in track and field," he said. "Something I am honoured and exited to be able to do." The Canada Games athletics events are scheduled for July 31 to August 4 in Winnipeg.